The hype around #D365SatSco that had been going for a couple of months finally became a real experience in Glasgow. This was the first big community event for the Scots, and they nailed it 110 %. The immediate feedback from the Microsoft Dynamics Community was that this was one of the best D365 Saturdays ever. What is a Dynamics 365 Saturday then? In short, it’s a Microsoft Dynamics community conference concept founded by Microsoft Business Applications MVP Razwan Choudry. There are several Dynamics 365 Saturdays held around the world. The conferences are always free to attend and feature the most prominent speakers from the world of Dynamics and Power Platform. This year, we got the chance to present our own sessions at D365 Saturday Scotland. All the upcoming conferences can be found here. The conference in Glasgow was a two-day event instead of a usual 1-day Saturday. The man, the myth, the legend, who is also known as Ben Vollmer, hosted a Connected Field Service hackathon on Friday the 25th. The hackathon had a different twist from the usual CFS hands-on-labs: Ben gave us MXCHIPs and Flic buttons and told us to “create something” with the devices and Azure IoT Central. Shaking the MXCHIP simulates closing a fridge door. Shaking the chip creates an IoT alert in Dynamics 365 CE. An IoT alert creates a Flow Push notification stating that new beer has arrived in the fridge. Pushing a Flic button measures the temperature of the beer. If it is cold enough to be drinkable, a Flow push notification is created stating that beer is cold and drinkable. If beer is cold and drinkable, a Tweet is created. The second day of the event was divided into one-hour sessions running on four simultaneous tracks. A wide range of subjects was covered in these sessions and unfortunately, we had no time to see or mention them all. Sara managed to catch the talented Megan Walker talk about “The A-Z of Marketing & Branding” where she gave 26 tips on how to configure Dynamics 365 Customer Engagement to make sure your company has a consistent brand. 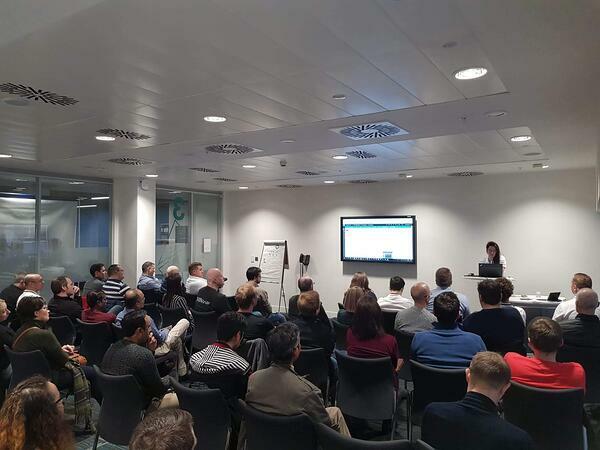 Sara also participated in Lucy Muscats’ “Microsoft Teams Top 10” session, ten amazing features that made you wonder how you ever managed to get by without knowing, presented by Lucy with funny punchlines all the way through. Sara herself did a presentation about Dynamics CE No-code Hacks. It was a live demo configuration session where she turned a couple of requirements into fully working solutions within 30 minutes. If you missed out, she’s doing a similar session at D365 Munich on the 9th of March! Antti caught sessions by Kyle Hill on the Adobe Marketing Cloud, Ana Demeny on DevOps, TDG on Stack Armageddon, Mark Smith on consulting skills and Ben Vollmer on new functionalities in Field Service. What’s awesome about a Dynamics 365 Saturday is that it’s possible to learn new things from a wide range of topics like soft skills, dev stuff, product knowledge and so on. Antti’s own session was on extending D365 Project Service Automation and Field Service with Microsoft Flow. The session was a mix of PSA and FS basics followed by a deep dive demo of using Flow instead of code to get more out of the applications. Antti is doing this presentation again in Dynamics 365 Saturday Munich on the 9th of March. We are happy that at Innofactor, we also have so much cool stuff cooking in the area of Microsoft Dynamics. One great example is our Microsoft Dynamics 365 Experience Room, located both at our offices in Espoo and Stockholm. It is a unique concept where your team gets to solve real-life business scenarios using a fully integrated cloud solution environment powered by Microsoft Dynamics 365 business applications, Office 365 and LinkedIn Sales Navigator. All and all, an amazingly well-arranged event that we were delighted to be a part of! Big thanks to Iain Connolly, Mark Christie, Hayley Talent and Claire Carmichael for arranging this, and especially for the haggis bonbons! Until next time! Antti is a Dynamics 365 Customer Engagement consultant and a Microsoft Business Applications MVP. You can meet him at Dynamics 365 Saturday Munich in March and Dynamics 365 Saturday Kyiv in May. You can follow Antti on Twitter or LinkedIn. Sara is a Dynamics 365 Customer Engagement Business Consultant who is driven by delivering maintainable solutions to businesses. She had previous speaking engagement in events like eXtreme365 Austin and D365 Saturday Stockholm. Next up for Sara is D365 Saturday Munich and UG Summit and eXtreme365 in Amsterdam. You can follow Sara on Twitter or LinkedIn.